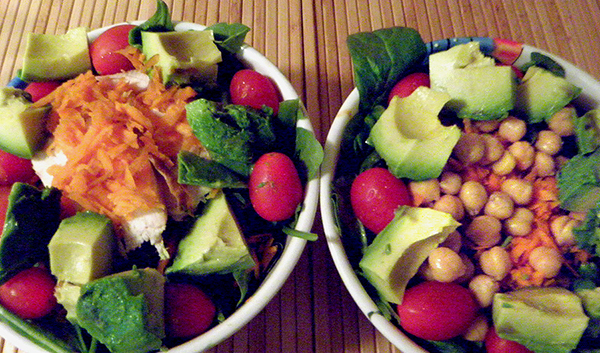 Salads! Always healthful, and now in season. For a while I’d been dependent on a pre-made Nob Hill salad for my after-work late lunch. And I felt plenty guilty about the amount of plastic containers I’d recycle. Then I looked at the ingredients and did the math. I didn’t like the lentils in the salad, nor the skimpy amount of egg, tomato, and chickpeas. I thought I could change things up and add avocado. Plus, I could upgrade to organic ingredients. Oddly enough, since I’ve been making my own, our local Nob Hill has stopped carrying the salad. Was my consumption driving their business? Somehow I doubt it. I’ve already created a Creamy Lemon Vinaigrette like Nob Hill uses, for my Californian Salad Nicoise recipe. 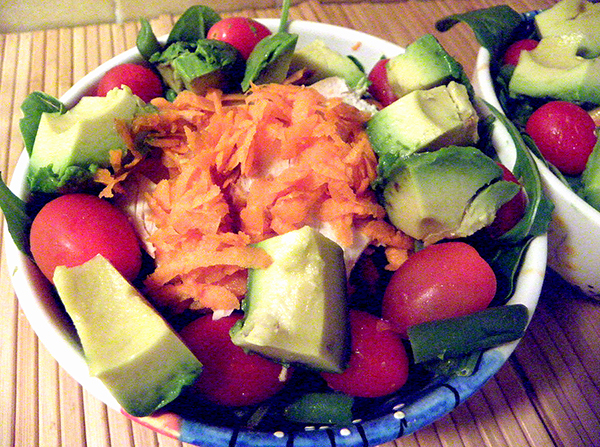 But in fact, I like this salad better without the thick dairy-based dressing. I like Paul Newman’s Balsamic Vinaigrette or Lime Vinaigrette for most workdays. For DIY days I’ve included a lemon vinaigrette in the recipe below, based on an kicked-up Salad for Dinner recipe. Or substitute the Tarragon Vinaigrette from my Spring Chopped Salad (for variety substitute any other herb for tarragon), or the Dijon Vinaigrette from my Spinach Salad. Or try your favorite Italian or French style dressing. 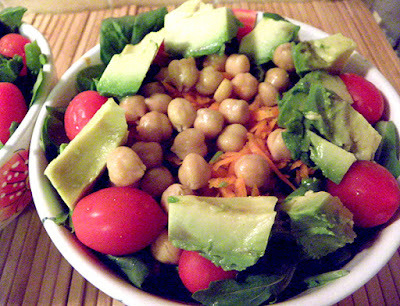 Endless variety is possible with this salad. Chicken, chickpeas, egg, and quinoa are the protein sources. Eliminate the chicken and it’s vegetarian. Use just the chickpeas and quinoa and it’s vegan. Use only chicken and/or egg and it’s low carb. Out of eggs, skip them. Personally I find grating carrots tiresome, so I’ve sometimes eliminated them, or bought them pre-grated. You could try heirloom tomato wedges in place of cherry tomatoes. Or eliminate the avocado to make the salad more like Nob Hill’s original. You could sprinkle crunchy sunflower seeds over the top, especially good if you’re using only egg for the protein. Or top with leftover cooked veggies, like corn or green beans. If you’re inspired, please leave your version of high protein salad in a comment below. 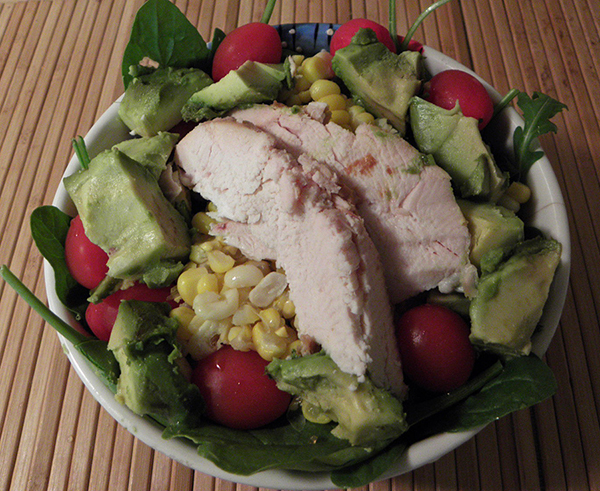 Toss spinach and arugula together and place in the bottom of a large individual salad bowl. Press down slightly to hold other ingredients. Scoop quinoa into the center of the salad and press down. Add chickpeas around the side of the bowl. Place grated carrots on top of quinoa. Add a ring of cherry or grape tomatoes on top of the chickpeas. Position chicken slices on top of carrots in center. Top with chopped egg, or position egg slices around chicken slices. 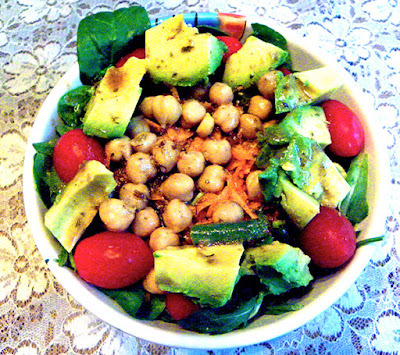 Top all with diced avocado. Or, arrange however you like. Add herbs, lemon zest, and salt to immersion blender cup. Add lemon juice, balsamic vinegar, and water. Buzz briefly with blender to mix. With blender operating, add olive oil in a steady stream. If using dry herbs, allow 1 – 2 hours before serving, so herbs can hydrate. Mix 1/3 cup dry quinoa with 2/3 cup water in microwavable casserole. Cover and microwave on high for 5 minutes. Carefully pour off as much water as you can (this eliminates any bitterness from the grain). Add 1/4 cup fresh water and stir. Cover and microwave 3 minutes. Uncover carefully (to avoid burns from steam) and fluff with a fork. Cover and microwave 2 more minutes. Uncover and fluff again. If there is residual water, cover and microwave 1 more minute. Fluff with fork and serve hot, or chill to use in salads.